Activists are committed individuals who seek to correct perceived problems in society by educating the public, taking direct action, and urging government officials to act. There are activism opportunities in politics and with government agencies, at colleges and universities, in law offices, with nonprofit advocacy organizations and foundations, in court systems, in foreign countries, and in countless other settings. 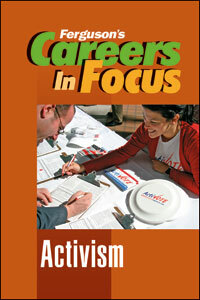 Careers in Focus: Activism profiles 20 careers for motivated people who want to make a difference in a rewarding position.